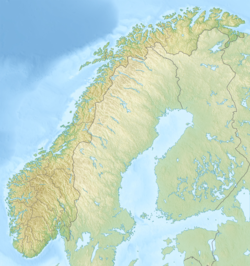 Sønningen is a lake in the municipality of Levanger in Trøndelag county, Norway. The 0.86 km2 (210-acre) lake lies about 2.5 km (1.6 mi) southwest of the village of Ekne, about 2 km (1.2 mi) west of the lake Byavatnet, and about 2.3 kilometres (1.4 mi) southeast of the shore of the Trondheimsfjorden. ^ "Sønningen, Levanger (Trøndelag)" (in Norwegian). yr.no. Retrieved 2011-05-24. This page was last edited on 2 April 2018, at 15:59 (UTC).